More than 90% of materials currently disposed of in incinerators and landfills can be reused, recycled and composted. Cities around the world are promoting zero waste practices that benefit public health and the climate.xiv Zero waste practices such as recycling and composting serve to conserve three to five times the amount of energy produced by waste incineration,xv and create significantly more jobs.xvi The amount of energy wasted in the U.S. by not recycling aluminum and steel cans, paper, printed materials, glass, and plastic is equal to the annual output of 15 medium-sized power plants.xvii Incinerators directly undermine zero waste efforts by diverting valuable resources (both money and materials) and locking cities in to wasteful systems. Instead of promoting expensive and polluting facilities that distract attention from the real problem, we can and should be giving zero waste practitioners the credit and resources they need to expand and strengthen their work. i 3 Bullard, Robert. 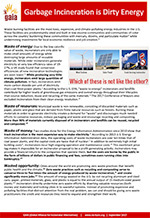 Dismantling Energy Apartheid in the U.S., Black History Month Special Report. February 2011.
iv Fichtner Consulting Engineers Limited, The Viability of Advanced Thermal Treatment in the UK, 2004, p.4. vi U.S. EPA, “Solid Waste Management and Greenhouse Gases, A Life-Cycle Assessment of Emissions and Sinks 3rd edition,” 2006.
viii Platt, Brenda et al, Stop Trashing the Climate, ILSR, Eco-Cycle & GAIA, 2008.
xiii Tavernise, Sabrina, City Council in Harrisburg Files Petition of Bankrupty, The New York Times, October 2011.
xvii U.S. Senate. Bill S. 3654 [109th]: Recycling Investment Saves Energy. Introduced July 13, 2006.